Use the following solubility rules to answer questions 1−4. Salts containing halide anions are soluble except for those containing Ag+, Pb2+, and Hg22+. Salts containing carbonate anions are insoluble except for those containing alkali metals or ammonium. 1. If solutions of iron (III) nitrate and sodium carbonate are mixed, what would be the formula of the precipitate? (D) No precipitate would form. 2. 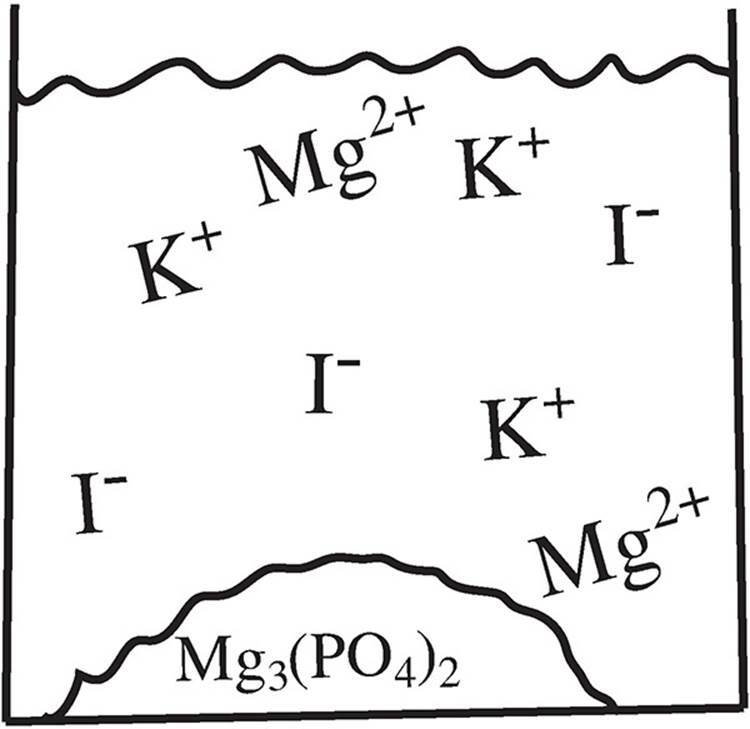 If solutions containing equal amounts of AgNO3 and KCl are mixed, what is the identity of the spectator ions? 3. If equimolar solutions of Pb(NO3)2 and NaCl are mixed, which ion will not be present in significant amounts in the resulting solution after equilibrium is established? 4. Choose the correct net ionic equation representing the reaction that occurs when solutions of potassium carbonate and copper (I) chloride are mixed. 5. A strip of metal X is placed into a solution containing Y2+ ions and no reaction occurs. When metal X is placed in a separate solution containing Z2+ ions, metal Z starts to form on the strip. Which of the following choices organizes the reduction potentials for metals X, Y, and Z from greatest to least? 6. Which of the following is true for an endothermic reaction? (A) The strength of the bonds in the products exceeds the strength of the bonds in the reactants. (B) The activation energy is always greater than the activation energy for an exothermic reaction. (C) Energy is released over the course of the reaction. (D) A catalyst will increase the rate of the reaction by increasing the activation energy. 7. In which of the following compounds is the oxidation number of chromium the greatest? 9. What is the mass ratio of fluorine to boron in a boron trifluoride molecule? 10. Based on the particulate drawing of the products for the reaction below, which reactant is limiting for the following reaction and why? (A) The K3PO4, because there are no excess PO43− ions after the reaction. (B) The MgI2, because there are excess Mg2+ cations remaining after the reaction. (C) The K3PO4, because it contains a cation that cannot form a precipitate. (D) The MgI2, because it requires more of itself to create the products. 11. What is the mass of oxygen in 148 grams of calcium hydroxide (Ca(OH)2)? 12. An ion containing only oxygen and chlorine is 31% oxygen by mass. What is its empirical formula? Use the following information to answer questions 13−16. 13. If 12.25 g of potassium chlorate decomposes, how many grams of oxygen gas will be generated? 14. Approximately how many liters of oxygen gas will be evolved at STP? 15. If the temperature of the gas is doubled while the volume is held constant, what will happen to the pressure exerted by the gas and why? (A) It will also double because the gas molecules will be moving faster. (B) It will also double because the gas molecules are exerting a greater force on each other. (C) It will be cut in half because the molecules will lose more energy when colliding. (D) It will increase by a factor of 4 because the kinetic energy will be four times greater. 16. Why is a catalyst present during the reaction? (A) A catalyst is necessary for all decomposition reactions to occur. (B) A catalyst reduces the bond energy in the reactants, making them easier to activate. (C) A catalyst reduces the energy differential between the reactants and the products. (D) A catalyst lowers the activation energy of the overall reaction and speeds it up. 17. A sample of a hydrate of CuSO4 with a mass of 250 grams was heated until all the water was removed. The sample was then weighed and found to have a mass of 160 grams. What is the formula for the hydrate? When the half reaction above is balanced, what is the coefficient for OH− if all the coefficients are reduced to the lowest whole number? If the reaction above took place at standard temperature and pressure and 150 grams of CaCO3(s) were consumed, what was the volume of CO2 ( g) produced at STP? 20. A gaseous mixture at 25°C contained 1 mole of CH4 and 2 moles of O2 and the pressure was measured at 2 atm. The gases then underwent the reaction shown below. What was the pressure in the container after the reaction had gone to completion and the temperature was allowed to return to 25°C? 21. A hydrocarbon was found to be 20% hydrogen by weight. If 1 mole of the hydrocarbon has a mass of 30 grams, what is its molecular formula? Which of the following statements about the reaction given above is NOT true? (A) The oxidation number of chromium changes from +6 to +3. (B) The oxidation number of iodine changes from −1 to 0. (C) The oxidation number of hydrogen changes from +1 to 0. (D) The oxidation number of oxygen remains the same. 23. In which of the following molecules does hydrogen have an oxidation state of −1? 24. Oxygen takes the oxidation state −1 in hydrogen peroxide, H2O2. The equation for the decomposition of H2O2 is shown below. Which of the following statements about the reaction shown above is true? (A) Oxygen is reduced, and hydrogen is oxidized. (B) Oxygen is oxidized, and hydrogen is reduced. (C) Oxygen is both oxidized and reduced. (D) Hydrogen is both oxidized and reduced. Based on the reduction potentials given above, what is the reaction potential for the following reaction? Based on the reduction potentials given above, which of the following reactions will be favored? Use the following information to answer questions 28−31. The concentrations of the solutions in each half-cell are 1.0 M.
28. Which of the following occurs at the cathode? (A) Cr3+ is reduced to Cr(s). (B) Pb2+ is reduced to Pb(s). (C) Cr(s) is oxidized to Cr3+. (D) Pb(s) is oxidized to Pb2+. 29. If the Cr3+ solution was replaced with a solution at a higher concentration, what would happen to the E° value for the cell? (A) It would increase because of the presence of extra Cr3+ ions, which are able to donate more electrons. (B) It would increase because the reaction would become more favored. (C) It would decrease because the additional Cr3+ ions would drive the equation to the left. (D) It would decrease because the stoichiometric ratio of Cr3+ ions to Pb2+ ions is less than 1 in the balanced reaction. 30. Which of the following best describes the activity in the salt bridge as the reaction progresses? 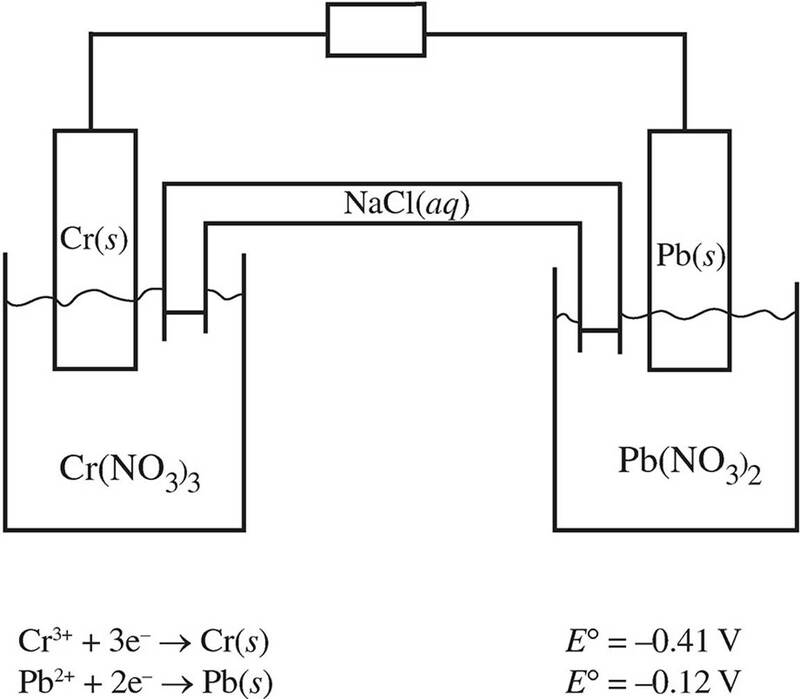 (A) Electrons flow through the salt bridge from the Pb/Pb2+ half-cell to the Cr/Cr3+ half-cell. (B) Pb2+ flows to the Cr/Cr3+ half-cell, and Cr3+ flows to the Pb/Pb2+ half-cell. (C) Na+ flows to the Cr/Cr3+ half-cell, and Cl− flows to the Pb/Pb2+ half-cell. (D) Na+ flows to the Pb/Pb2+ half-cell, and Cl− flows to the Cr/Cr3+ half-cell. 31. Based on the given reduction potentials, which of the following would lead to a reaction? 1. A 10.0 gram sample containing calcium carbonate and an inert material was placed in excess hydrochloric acid. A reaction occurred producing calcium chloride, water, and carbon dioxide. (a) Write the balanced equation for the reaction. (b) When the reaction was complete, 900 milliliters of carbon dioxide gas were collected at 740 mmHg and 30°C. How many moles of calcium carbonate were consumed in the reaction? (c) If all of the calcium carbonate initially present in the sample was consumed in the reaction, what percent by mass of the sample was due to calcium carbonate? (d) If the inert material was silicon dioxide, what was the molar ratio of calcium carbonate to silicon dioxide in the original sample? 2. A gaseous hydrocarbon sample is completely burned in air, producing 1.80 liters of carbon dioxide at standard temperature and pressure and 2.16 grams of water. (a) What is the empirical formula for the hydrocarbon? (b) What was the mass of the hydrocarbon consumed? (c) The hydrocarbon was initially contained in a closed 1.00 liter vessel at a temperature of 32°C and a pressure of 760 millimeters of mercury. What is the molecular formula of the hydrocarbon? (d) Write the balanced equation for the combustion of the hydrocarbon. 3. The table below shows three common forms of copper ore.
(a) What is the percent by mass of copper in Cu2S? (b) What is the empirical formula of ore #2? (c) If a sample of ore #3 contains 11.0 grams of iron, how many grams of sulfur does it contain? If 3.84 grams of O2 are consumed in the process, how many grams of Cu are produced? (a) If 1.46 grams of Mg(s) are added to 500 milliliters of a 0.200-molar solution of CuSO4, what is the maximum molar yield of H2( g)? (b) When all of the limiting reagent has been consumed in (a), how many moles of the other reactant (not water) remain? (c) What is the mass of the Cu2O produced in (a)? 5. A student performs an experiment in which a bar of unknown metal M is placed in a solution with the formula MNO3. 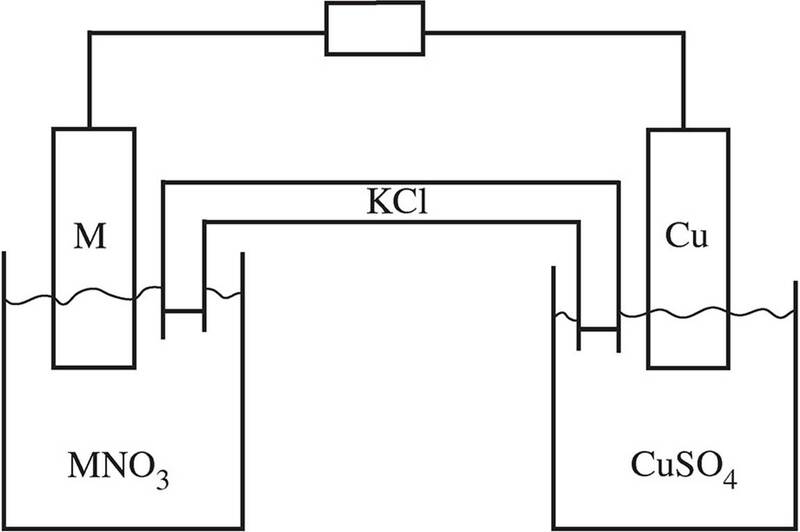 The metal is then hooked up to a copper bar in a solution of CuSO4 as shown below. A salt bridge of KCl links the cell together. The potential for each cell was tested and found to have a value +0.74 V. Separately, when a bar of metal M is placed in the copper sulfate solution, solid copper starts to form on the bar. When a bar of copper is placed in the MNO3 solution, no visible reaction occurs. (a) Write the net ionic equation that takes place in the Cu/M cell. (b) What is the standard reduction potential for metal M? (c) Which metal acted as the anode and which as the cathode? Justify your answer. (d) On the diagram of the cell, indicate which way the electrons are flowing in the wire. Additionally, indicate any ionic movement occurring in the salt bridge. (e) What would happen to the voltage of the reaction in the Cu/M cell if the concentration of the CuSO4 increased while the concentration of the MNO3 remained constant? Justify your answer. (a) Write the net ionic equation that takes place during this reaction. (b) Qualitatively describe what an observer would see taking place at each electrode. (c) Will the solution become acidic, basic, or remain neutral as the reaction progresses? (d) How long would it take to create 1.2 g of Ni(s) at the cathode?